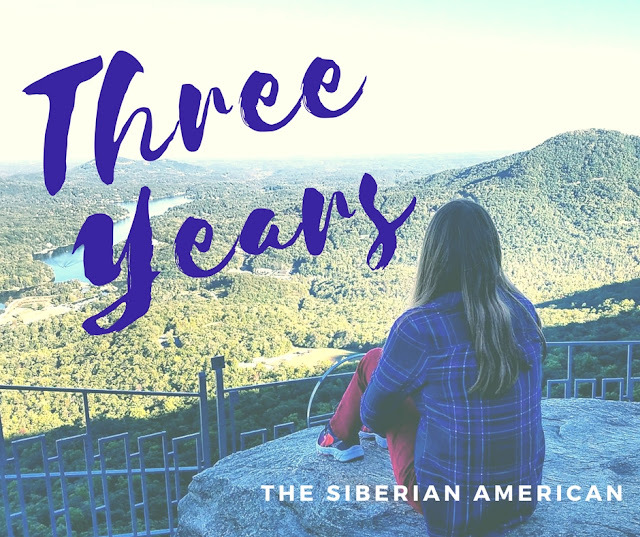 The Siberian American: Cheers to Three Years of Blogging! Today is the three-year anniversary of my first blog post for The Siberian American. I remember buying the domain for three years and wondering if I would actually still be committed when it was time to renew. Here I am three years later, still in love with blogging, and I definitely renewed that domain a month ago! Even though I’ve had to cut back on posting during pregnancy, I am always thankful for this wonderful community. I’ve met and connected with so many great people, and I am grateful for all of you. My goal is to ramp up posting again in September and to keep it up when our little man arrives. It’s so crazy how many life changes this blog has seen in just three years: when I first started writing, Chris was still in medical school, and we had no idea where Match would send us. Now we’re back in Dallas after a year in Chicago and already in the third year of residency with a baby on the way! So, cheers to three years! I am so grateful we are on this journey together, and I can’t wait to share more of our adventures with y’all! It really is amazing how much can change in such a short amount of time! I started blogging right around 3 years ago, and I've loved all of the friends that I've made through blogging too! Congrats on the 3-year milestone! I can't believe I've been blogging for almost 5 years. Time flies when you're having fun! Have a great weekend! Happy Three Years, Olya!! I'm so glad I came across your blog! Happy blogiversary!!!! Love reading along with you! yay! congrats on three years, it's amazing how fast time goes while blogging, I am almost at three years too! Congrats of 3 years Olya!